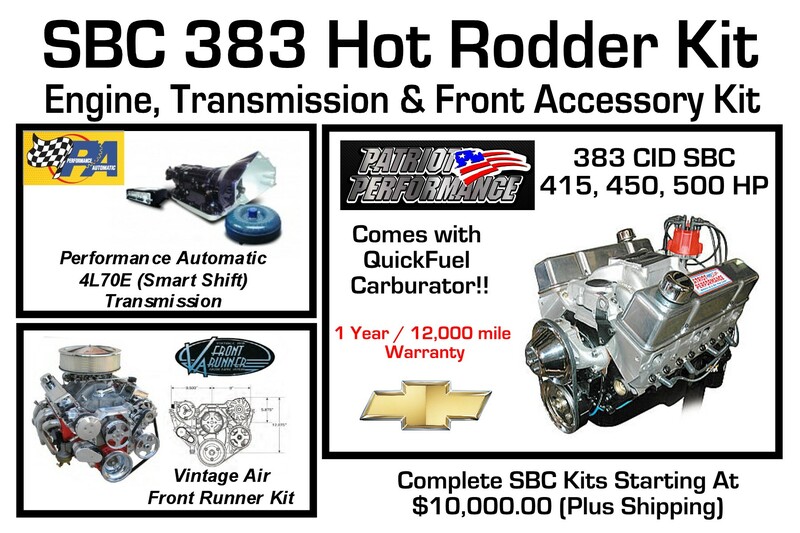 ENGINE - Patriot Performance 383 cid SBC that comes with a 12,000 mile or 1 year warranty. 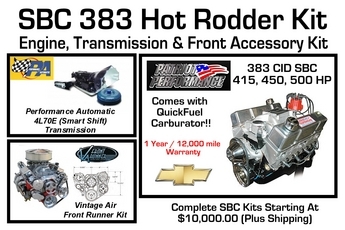 Kit comes complete with Patriot Performance 383 Cubic Inch 415 horsepower small block Chevy, based upon a brand new Dart 4 bolt main iron block. Coupled with a Performance Automatic 4L70E Street Smart Transmission, complete with converter, fluid tube and dip stick, mounts, dust cover, carb kit, hardware and a 2 year warranty. Finally the kit is topped off with a Vintage Air Front Runner accessory drive kit, with your choice of Chrome or Black as well as with or without power steering. This kit is complete from front to back, and is ready to plug and play in your Hot Rod!